The following post is from (the LA Times’) Richard Abowitz’s Movable Feast, August 20, 2009 | 4:09 pm. [Abowitz continues:] Full disclosure: I have known Stein for years (having met him when he interviewed me on an earlier Vegas assignment), and he wrote for Los Angeles Times. Abowitz: So, was it immediately obvious on this trip that things were different for Vegas than during your previous visits? Stein: The weird thing was showing up at the Hotel (at Mandalay Bay). I had talked to a bunch of people and everyone confirmed the place was decimated. And I had seen photos of Echelon. And so I was expecting the worst. But when I showed up at the Hotel my room was messed up. And so I assumed that there must be 8,000 other rooms and so whatever. But the place was literally full. I walked out to the pool and it was packed. So, I guess the price cutting really worked and so the obvious things I was looking for were not there. Abowitz: How obvious was the price cutting? Stein: I signed up for lists and so I get all these e-mails like “$100 at the Wynn with a $50 dining coupon.” It is the same with MGM. The deals are out there. Abowitz: Well, the hotels are doing whatever it takes to not be empty. Your experience seems to suggest it is working. Stein: It is working. And, it is awesome if you are looking for a cheap vacation. They fill the place up. Abowitz: So, when did you notice the recession hidden amidst the bustle? Visit the main pages of the LasVegssBuffetClub. Above – Tuscany’s pool with Platinum Hotel and Spa in the background. 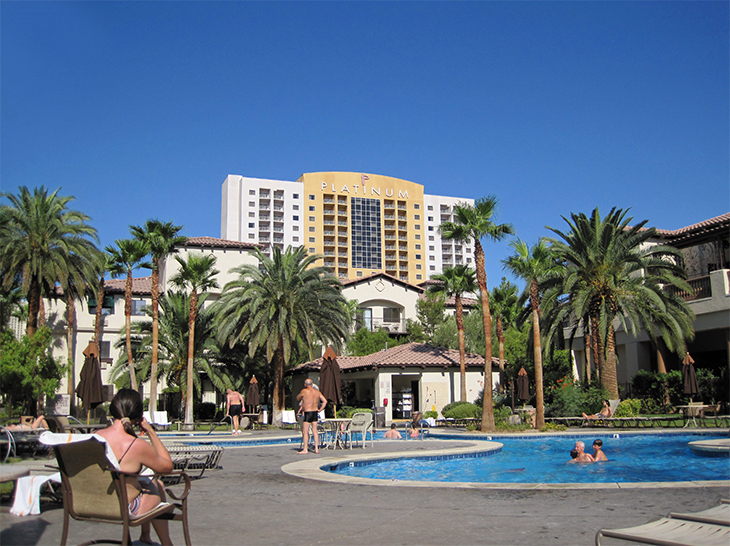 The Tuscan styled complex consists of several hotel buildings and the main casino building which houses the gaming area, the bars, restaurants, front desk and more. There are four restaurants: Tuscany Gardens (Fine Italian Dining,) The Cantina (casual Mexican,) Marilyn’s Cafe (24 Hours,) and Beachfront Coffee . Two dudes (sounding like a quartet) “Cool Change” perform six nights a week in the Piazza Lounge. This intimate lounge is jam-packed with couples dancing on the weekends. I got in on an internet special: $19.50 per night for four nights. My room had two huge beds, a sitting area with desk & chair, sofa, sofa-chair and cofee table. Then there was a small kitchenette with table/chairs, plenty of cupboards, a sink, small refrigerator, and a coffee-maker. Although Las Vegas hotel construction aien’t what it used to be (there’s a sense that some parts of the hotel are made of cardboard,) the room was really commodious and comfortable, and well appointed. 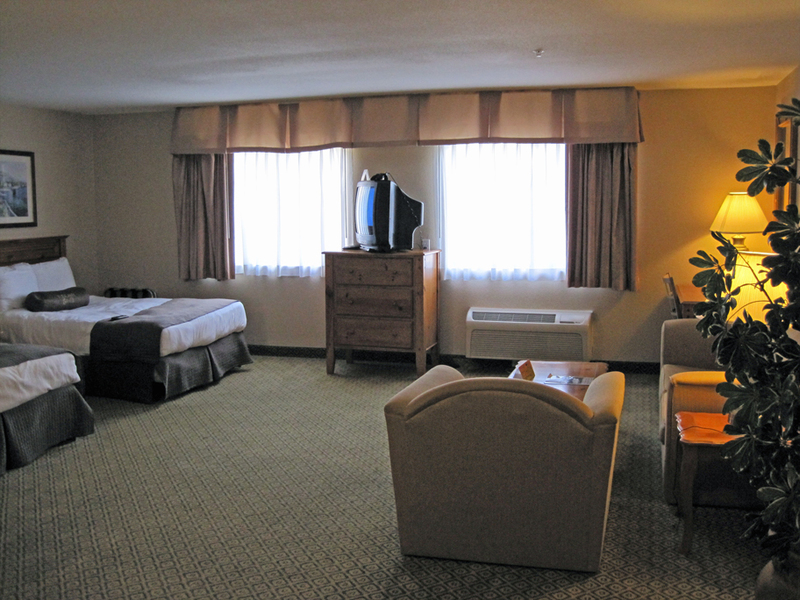 I was completerly surprised by the spaciousness of the room, and very satisfied. Information is from the Spud Monkey’s Official Website. María Rosario Pilar Martínez Molina Baeza is also known as Charo. 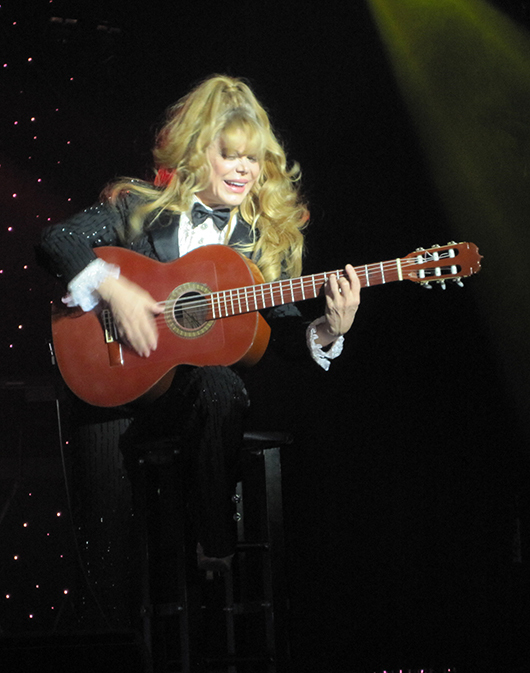 Charo’s August 5th performance at the Riviera Hotel in Las Vegas was executed in two parts. In the first half you saw the Charo you know: the comedian, the singer, and all-around show-woman. She was brilliant, funny and spectacular. She sparkled in a red-sequined outfit, singing tunes from her CD’s, such as: “I Will Survive,” and cracking jokes about accents as well as other aspects of the human condition. Without a doubt, the most humorous moment came when she spoke of being so poor in her youth that she didn’t have enough to eat – then after achieving success she couldn’t eat because of diets and weight watching – after saying this, she repeatedly “mouthed” the F bomb. Accompanied by a troup of Flamenco dancers and a high-power-group of musicians, the first half of the show was fast paced, hard-hitting and well rehearsed. The show’s lighting was an artful display of color and dream imagery. Now I’ll tell you about the positive stuff. Her fingers (both hands) were moving like she was a super-human being. The little-finger, of her left hand, was – relaxed – in the precise, classical position. This is something one can only achieve after years of practice. The “show stopper” for me was a moving rendition of Ravel’s Bolaro, of which you can hear a few bars on Charo’s website. According to IMDb, when she was 14, María Rosario Pilar Martínez Molina Baeza won a scholarship to study classical guitar with Andrés Segovia. Keep tuned to this page, there will soon be a link to a video clip of Charo. Time for another Full Moon! The moon will be 100% full August 5, 2009 at 5:56 P.M. Las Vegas time.